Converted from Catholicism to Judaism. Peruvian physician, controversial writer, and martyr; born in San Miguel, province of Tucuman, Peru, about 1592; burned at the stake in Lima Jan. 23, 1639. His father, Diego Nuñez de Silva, and his brother, Diego de Silva, were Neo-Christians, and had been "reconciled" by the Inquisition March 13, 1605. According to his own testimony, his mother, Doña Alaonsa Maldonado, and all her ancestors were Christians. Francisco was christened and baptized in San Miguel; he attended mass up to his eighteenth year; and otherwise he was a devout Catholic, until, on a visit to his father at Callao, he chanced to read the "Scrutinium Scripturarum" of Paul Burgos (Mantua, 1474 et seq.). His father, who was a "licentiate," then encouraged him to study the Bible, and confessed his secret adherence to the Mosaic faith. Thereupon Francisco, too, became a believing Jew, though outwardly observing all the ceremonies of the Catholic Church. So zealous had he in a short time become that he used every endeavor to convert to Judaism his sister, Doña Isabel de Maldonado, a fervent Christian. She confided the secret of her brother's real professions to her spinster sister, Doña Felipa de Maldonado, who, appearing one day "in the robes of the Society of Jesus" before the Inquisition, denounced Francisco as a Judaizing heretic. On the strength of this evidence his arrest was ordered on Dec. 12, 1626; but he was not apprehended until April 29, 1627. From the moment of his imprisonment a monk was detailed to reason with him, and to try to reclaim him. Together they searched Scripture; but the attempt to win him back failed. Francisco was then transferred to another prison, and a second church dignitary, "learned in the law," was charged with the same task, but he argued in vain. Francisco remained obdurate, and declared he was a believing Jew: "I care not if the whole world knows it. Let them come and burn me. They do not die who die thus, for God the Eternal keeps them ever alive; and I will proclaim this cheerfully at the stake." He refused to eat bacon, fasted forty days at a time in the expectation of the Messiah's advent, rigidly observed the Sabbath, and studied the Bible and commentaries on it in Hebrew and Latin. Secreted about his person he had a Jewish prayer-book; and he quoted lengthy passages in the original at the numerous hearings before the tribunal. 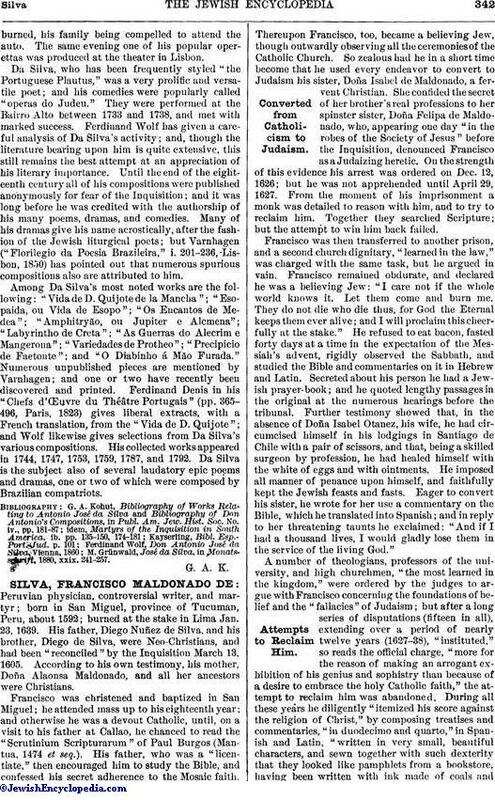 Further testimony showed that, in the absence of Doña Isabel Otanez, his wife, he had circumcised himself in his lodgings in Santiago de Chile with a pair of scissors, and that, being a skilled surgeon by profession, he had healed himself with the white of eggs and with ointments. He imposed all manner of penance upon himself, and faithfully kept the Jewish feasts and fasts. Eager to convert his sister, he wrote for her use a commentary on the Bible, which he translated into Spanish; and in reply to her threatening taunts he exclaimed: "And if I had a thousand lives, I would gladly lose them in the service of the living God." A number of theologians, professors of the university, and high churchmen, "the most learned in the kingdom," were ordered by the judges to argue with Francisco concerning the foundations of belief and the "fallacies" of Judaism; but after a long series of disputations (fifteen in all), extending over a period of nearly twelve years (1627-38), "instituted," so reads the official charge, "more for the reason of making an arrogant exhibition of his genius and sophistry than because of a desire to embrace the holy Catholic faith," the attempt to reclaim him was abandoned: During all these years he diligently "itemized his score against the religion of Christ," by composing treatises and commentaries, "in duodecimo and quarto," in Spanish and Latin, "written in very small, beautiful characters, and sewn together with such dexterity that they looked like pamphlets from a bookstore, having been written with ink made of coals andwith the crooked leg of a hen." 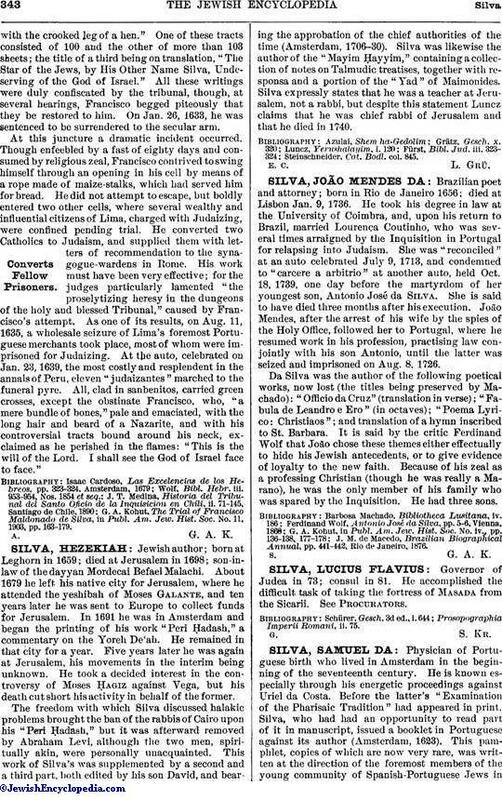 One of these tracts consisted of 100 and the other of more than 103 sheets; the title of a third being on translation, "The Star of the Jews, by His Other Name Silva, Undeserving of the God of Israel." All these writings were duly confiscated by the tribunal, though, at several hearings, Francisco begged piteously that they be restored to him. On Jan. 26, 1633, he was sentenced to be surrendered to the secular arm. At this juncture a dramatic incident occurred. Though enfeebled by a fast of eighty days and consumed by religious zeal, Francisco contrived to swing himself through an opening in his cell by means of a rope made of maize-stalks, which had served him for bread. He did not attempt to escape, but boldly entered two other cells, where several wealthy and influential citizens of Lima, charged with Judaizing, were confined pending trial. He converted two Catholics to Judaism, and supplied them with letters of recommendation to the synagogue-wardens in Rome. His work must have been very effective; for the judges particularly lamented "the proselytizing heresy in the dungeons of the holy and blessed Tribunal," caused by Francisco's attempt. As one of its results, on Aug. 11, 1635, a wholesale seizure of Lima's foremost Portuguese merchants took place, most of whom were imprisoned for Judaizing. At the auto, celebrated on Jan. 23, 1639, the most costly and resplendent in the annals of Peru, eleven "judaizantes" marched to the funeral pyre. All, clad in sanbenitos, carried green crosses, except the obstinate Francisco, who, "a mere bundle of bones," pale and emaciated, with the long hair and beard of a Nazarite, and with his controversial tracts bound around his neck, exclaimed as he perished in the flames: "This is the will of the Lord. I shall see the God of Israel face to face." G. A. Kohut, The Trial of Francisco Maldonado de Silva, in Publ. Am. Jew. Hist. Soc. No. 11, 1903, pp. 163-179.